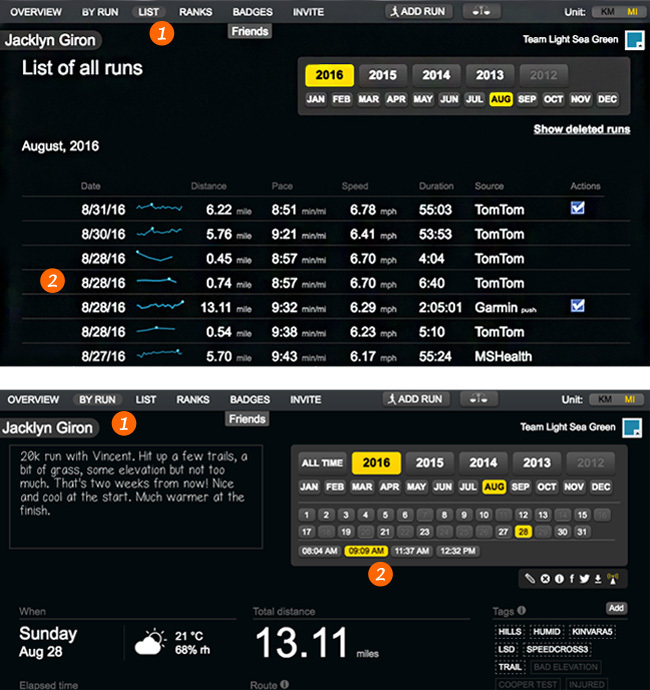 Smashrun is an analytical platform for runners. It helps uncover interesting correlations between training habits and performance over time and it's super easy to use! Smashrun combines basic run metrics alongside advanced charts and graphs to provide both a "big picture" snapshot and "by run" specific analysis of a runner's entire running history. We also use badges as milestones for running achievements and rank users against their chosen peers. Do I need an app or device to use Smashrun's functionality? Is it possible to change my Smashrun URL? Can I change my default unit to kilometers instead of miles? How do I set my profile to private? Does Smashrun have a mobile app? How do I manually enter my runs? How do I edit or delete a run? How do I find and follow friends? How do I view multiple runs in one day? How does Smashrun calculate total calories burned? How is weather data determined for each run? 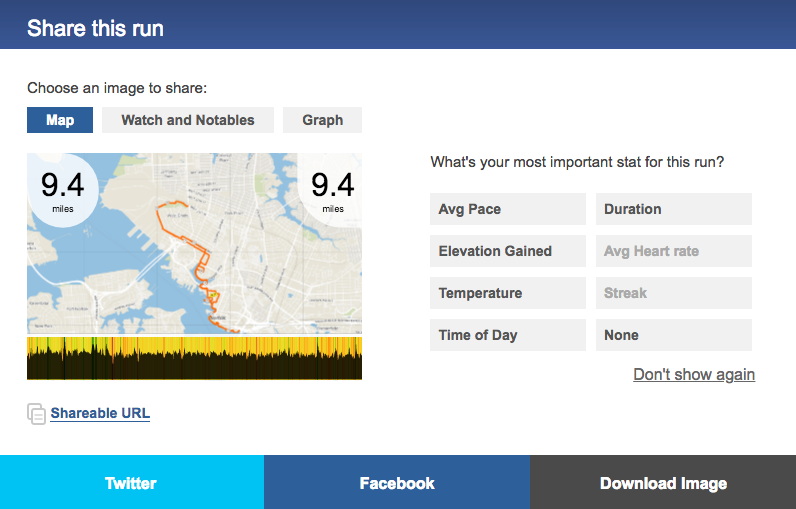 How do I share my runs on Facebook? How do I invite my friends to join Smashrun? Unfortunately, it’s not currently possible to change your vanity URL on Smashrun. However, if there was an error during registration and you’re unable to access your own URL due to special characters, we can help you fix it. Just send us an email on hi@smashrun.com. Click on ‘settings’ in the top navigation panel > scroll down a little and you’ll see Distance. Toggle the radio button for your preferred distance unit. Click Save Changes at the bottom of the page. 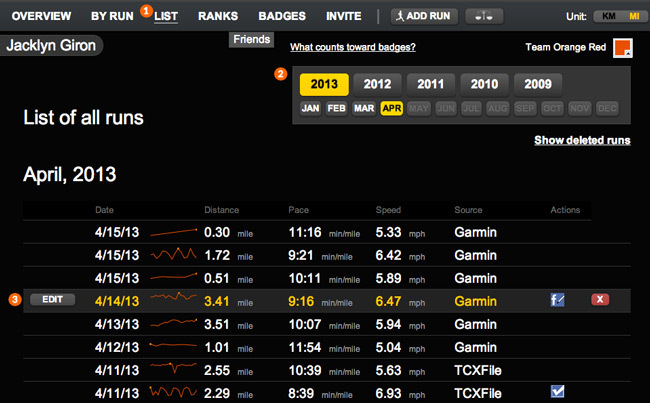 Note: to get back to the main Overview page, just click on ‘my runs’ in the top navigation panel. Within your Smashrun ‘settings’ page, there’s a section for Privacy which allows you to keep various types of information hidden from public view. You can even tell Google not to index your page! Just check the relevant boxes and click SAVE CHANGES. We don’t currently have near-term plans for developing our own mobile application. 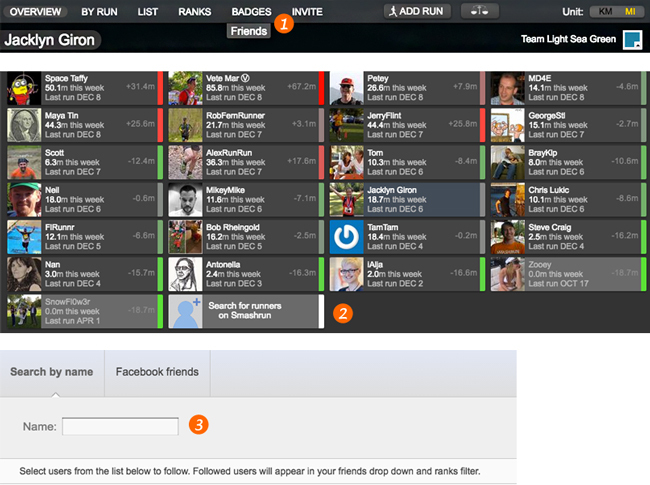 However, we’re currently working with a few developers of existing mobile running apps for Smashrun integration. What are all the different ways I can sync my data with Smashrun? Because Smashrun is not invested in any one particular app or device, users can switch between multiple apps or devices and still be able to keep a complete training log as long as they can export their runs as a GPX or TCX file. If you need to unfollow someone, you'll need to visit their profile, mouse over their name (it'll be yellow and located just beneath the link to Overview) and click the unfollow button. That will remove them from your friends drop-down. (2) or you can navigate in between runs for the same day within the By Run page. You'll see underneath the calendar on the top-right that there's a section for time. This will only show up if you logged more than one run for the same day. Smashrun calculates total calories burned using a formula provided by the Compendium of Physical Activities. To do this, we have to estimate your gross oxygen consumption (VO2) for every second you run based on your speed and the grade you were running on using the following equation from the American College of Sports Medicine. Then we just convert VO2 to METs (divide VO2 by 3.5 ml/min/kg). In effect, we're calculating your total calories burned from the bottom up. Of course, it would be way off if you don't enter your true weight since VO2 is measured in ml/kg of body weight. Trailing mileage is your total miles or kilometers on a rolling basis. For example, the last point on your trailing 7-day chart will show your total miles or kilometers for that day plus 6 days back for a total of 7 days. For more details, check out the release notes for trailing mileage charts: "Trailing miles and weekly running reports"
If you run 2km, the first kilometer up a hill and the second kilometer back down the hill, then the kilometer back down isn’t counted as a PR. Of course, you can game the system by only doing the downhill portion of a hill or stopping at the exact distance (like 1km or 1mi) of a flat run.